The new equipment made possible by the Texas A&M grant program will be a major improvement over the current gear on hand. The new Jaws of Life is rated at 269,000 lbs versus the out-of-date cutter at 86,000 lbs, which will make it much easier to cut into some of the new car materials on the market today. A new 40” ram will replace existing shorter models that have made it difficult in the past to push car dashes out of the way in order to extract drivers and passengers from a vehicle. The new glass cutter will also be a significant improvement to the current techniques of window punches and saws. This new cutter will work on laminated glass which will be in all new vehicles by 2018. The Super X 4 point rescue jacks will be the new addition to the department, allowing fire fighters to stabilize a vehicle during extraction. 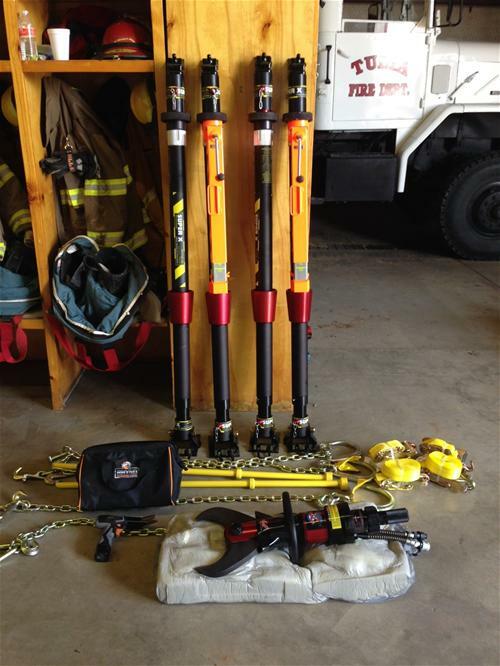 The TVFD is also purchasing additional high angle rescue equipment to add to their supply so that in the future they will also be able to rescue fire fighters that may be in trouble during an incident. Currently the department had limited equipment that did not allow for backup if a fire fighter were to need assistance during a rescue. The fire fighters recently completed a training session on July 22nd to try out some of their new repelling gear. “Thanks to these grant opportunities, we are able to improve our abilities and provide assistance on a variety of situations for Tulia citizens and the surrounding area” Daniels said.